A Democratic-expansionist regime from 1800 to 1860 which dissolved in the midst of the slavery and secession crisis. A Republican-capitalist regime 1860 to 1930, which was ended by the Great Depression. A Democratic-welfare regime from 1932 until the present, although with faltering support after 1980. Debt. 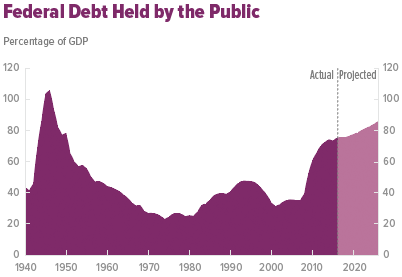 Our public (on which we pay interest) debt today is $13 trillion or 74% of GDP, the highest since right after the end of WWII, and is continuing to climb. Demographics. There are over 46 million Americans aged 65 and older today and this number is growing much faster than the overall population. The same for the number of people on Medicare (48 million) and Social Security (58 million). There will soon be only two workers for each retiree. How are we going to pay for the rapidly increasing costs of old age in the U.S.? Slowing Economic Growth. We know that economic growth has averaged only 2.1% a year since the end of the Great Recession in 2009. The economist Robert Gordon makes a strong argument, here and here, that the rate of economic growth is declining for fundamental reasons which will be very hard to counteract. Any number of events or developments could throw the system into a terminal crisis which would make it difficult for the U.S. to pay off the many commitments it has made. Such an upheaval would amount to the “fourth revolution” in our nation’s history. A serious prospect indeed! This entry was posted in debt, demography, economic growth, Jack Heidel, James Piereson and tagged congressional budget office, cutting spending, debt, Deficit spending, demographics, economic growth, fiscal responsibility, jack heidel by jackheidel. Bookmark the permalink. Yes. The future looks grim even through the most Pollyanna sunglasses.